Beatles comics are a fascinating and growing area of collecting. In recent years demand and interest for many titles has surged dramatically with prices nearly doubling, and in some case tripling. This rise in value is largely due to the increasing awareness of their actual rarity as well as the appreciation for their sheer appeal as collectibles. Yet, considering this, they are still quite reasonable when compared to some of the other Beatles collectible areas such as rare records and/or memorabilia. For example, at today's rate, it's entirely feasible to acquire the complete set of known Beatles comics in nice shape for under $2000, less than the price of only ONE Paste-over or nicely peeled "Yesterday And Today" Stereo Butcher Cover. What does this mean? We think it means that Beatles comics are a great investment at current relatively low prices. This is one of several areas of original Beatles collectibles that have been sort of overlooked over the years and are now being noticed with great interest (other areas are Beatles Sheet Music, Concert Tickets, and promotional posters). Perhaps most importantly, Beatles comic books are just plain fun to collect, making us glad that the Beatles phenomenon infiltrated just about every known medium including this one with flying colors!! Here we present The Beatles Comic Book Listing & Price Guide...information will continue to be added to this section. What's interesting and unique about Beatles comics is that they fall into two different collectors hobbies - Beatles and Comic books, and within those markets demand and price varies! Certain titles may be more in demand with comic book collectors than Beatles collectors, or visa-versa. As well, prices vary between the hobbies. It is important to note that the average values listed here are for copies in VG++ condition (very fine comic market grade), and that comic books are graded much stricter than records - a 100-point strict grading system is used (cover, inside & page brightness/brittleness, all factors are considered). True near-mint/mint copies of the scarcer books may sell for well over Near Mint guide prices, as is true with all rarer comic books. For some of the scarcer Beatles titles, no known "mint" copies have yet surfaced. For the benefit of completists, we have included books with small Beatles cameos, parodies, or even a mention of The Beatles. Cover scans and info will be added for the titles that do not have this yet, as well as more details for the existing listings. 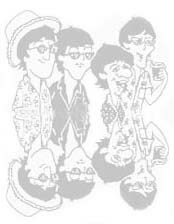 The most desirable and valuable Beatles comics are the original titles issued in the 1960s. Click on underlined Titles for large cover scan and more information. Beatles Experience 1 to 8 1991/92 Beatles stories $3.00 ea.